He is not an actor or singer, but he was honored the 2,327th star on the Hollywood Walk of Fame. Who is he? 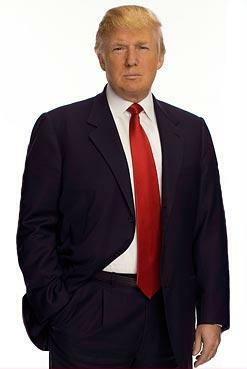 He is Donald Trump, the CEO of Trump Organization, an American-based real estate developer in the real estate market and the founder of Trump Entertainment, which operates gambling casinos. The billionaire entrepreneur is also the owner of The Miss Universe Organization and famous TV show, The Apprentice. “It really has been a special moment in my life,” Trump said in a live TV broadcast of the event on sunsplashed Hollywood Boulevard. He described The Apprentice has been an “absolutely amazing” experience. Trump’s baby son, Barron, almost managed to steal the show as his dad held him at the podium. “He’s strong, he’s smart, he’s tough, he’s vicious, he’s violent — all of the ingredients you need to be an entrepreneur, and most importantly, hopefully he’s smart because smart is really the ingredient,” the happy Trump said. Trump then handed his Pit Baby back to his Slovenian succubus bride, and proceeded to whip away the tarp hiding a scale model of his plans for his newly acquired real estate. The 45-story Trump Star Tower will unquestionably be the greatest, most outstanding high-rise L.A. has ever seen, making up for in verticality what it lacks in square footage (slightly less than four per floor), with spectacular city views of the Hollywood Basin and a rooftop deck floored with the original star, and characteristically featuring Trump’s name in gold letters polished to a gleaming sheen. 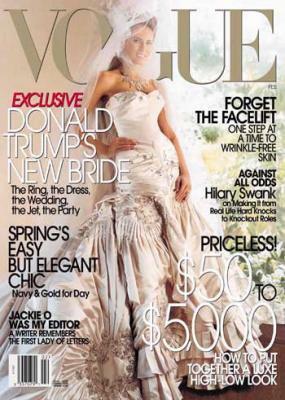 Melania Knauss poses in her wedding dress for the one of the covers of Vogue magazine. Donald Trump and Melania Knauss get married in 2005. Melania Knauss is top-tier model who has posed for GQ, Front and FHM. This entry was posted on Thursday, January 18th, 2007 at 7:36 pm	and is filed under Interesting Stuff. You can leave a response, or trackback from your own site.